What could be a better way to naturally amplify the thumping sound of your iPhone than adding exclusivity through a uniquely crafted dock? 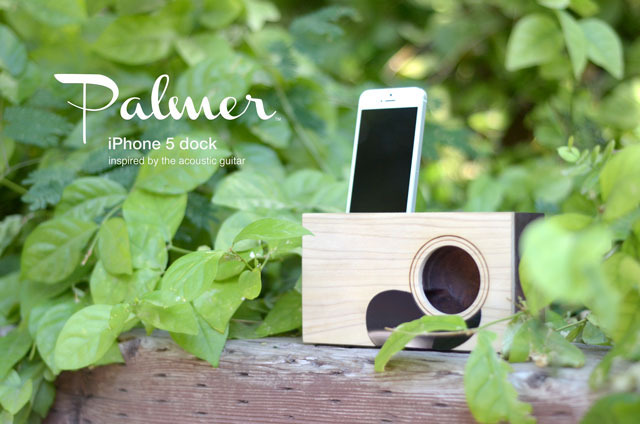 The new project by Nathan Mummert just rightly epitomizes the stated combination of originality and amplified tunes in the form of a new, exquisite Palmer iPhone 5 Dock. Inspired by an acoustic guitar, the wireless docking system beautifully merges with your elegant interiors and intensifies your favorite tunes wherever you go. The acoustic-inspired dock for your iPhone is meticulously hand crafted and thus, it endows a distinct, unique appeal to compliment your needs. While the authentic pick guard of Palmer renders a classic guitar look, the peripheral seamlessly manages to stand out and score well on its style factor. However, the coolest part remains Palmer’s wireless feature, which not only uses natural acoustics to amplify the tunes, but also allows you to enjoy your music wherever you go. So, whether you are in your home or office, you can easily listen to your favorite tunes without really fussing with cords or trying to spot an outlet. Engraved with the Palmer signature logo, the device benefits from the high quality materials for its sturdy construction and ensures unprecedented durability for all the right reasons. Although the docking station is handcrafted, and it integrates natural artistry, it still provides a supreme feel and achieves the highest standard of acoustic sound. The device, in fact, gets the most from some of the best woods, thus helping Palmer strengthen its overall construction furthermore. The new Palmer dock for iPhone 5 comes with a price tag reading $59; however, it will later retail for $69-79. The Limited Edition Palmer Dock, on other hand, will halt at 100 units, available for $79 each.